It has taken more than two years to build, but on Friday, Starbucks will open its first Italian outlet. The company's Milan "roastery" goes far beyond the usual latte production line. The marble-floored store will offer a "theatre of coffee roasting, brewing and mixology", as well as cocktails, pizza, bread and ice cream. Local businesses said they were "not afraid" of the competition, and emphasised that high-quality coffee was already widely available in the region. 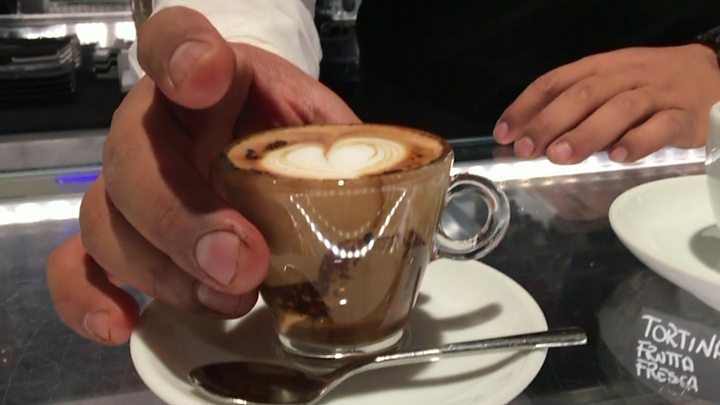 The Federazione Italiana Pubblici Esercizi (FIPE), which represents the country's bars and restaurants, said Italy's 149,154 coffee outlets offered good value, charging an average of one euro for an espresso, and €1.30 (£1.17) for a cappuccino. Starbucks said its Milan store was intended as a "homage" to Italy's coffee traditions. But while the materials and craftsmanship are locally sourced, the new store is emphatically part of the chain's global ambitions. About a third of a football pitch in size, it inhabits the historic Poste building near the cathedral in Piazza Cordusio, and is the third of Starbucks' new concept "roasteries" (the first two are in Shanghai and Seattle). Traditional Italian coffee shops are designed for a quick pit-stop, where customers can knock-back a mouthful of espresso without even stopping to sit down. Starbucks is hoping to offer something different. 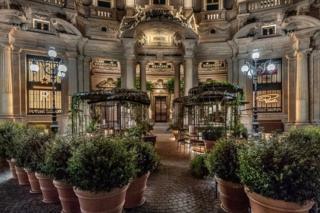 Can Starbucks succeed in Italy? Customers are invited to witness the bean-to-cup process: green coffee being poured out of burlap sacks, going through the roaster, and reaching "a dramatic crescendo" as the six-and-a-half metre bronze cask they're processed in "unfolds like a blooming flower". Not content with taking on Italian coffee-drinkers, Starbucks is also offering pastries, bread and pizza from a wood-fired oven, and an affogato station where you can finish off your ice cream with a liquid nitrogen quick freeze and a dose of espresso. The theatrics will attract a certain amount of attention, but when Starbucks opens further, more low-key outlets in Italy, as it intends to later this year, they won't be without competition. While Costa, which Coca-Cola recently agreed to buy, has not yet ventured into the country, there are local Italian-owned chains. Coffee Joint and Arnold Coffee both boast several branches in Milan selling milky coffees that Italians consider to be "American-style", alongside muffins, brownies and bagels. Italian-owned brands Lavazza and Illy Caffee have both opened flagship sites not far from Starbucks' new outlet. But the body representing existing Italian coffee outlets welcomed the arrival of an American competitor. "New commercial initiatives such as the opening of Starbucks are always in our favour, all the more so when they create jobs," the Federazione Italiana Pubblici Esercizi (FIPE) said. "Our coffee bars are not afraid of comparison. On the contrary, it will be a stimulus to improve quality and service"
Jonny Forsyth, an analyst at market researcher firm Mintel, said Starbucks could succeed in Italy, given that both Domino's and McDonald's have managed to make in-roads in the country. Mintel's research, which estimates the Italian coffee market was worth €19.4bn (£17.4bn) last year, suggests 16-to-35 year-olds are open to American coffee-style concepts such as flavoured Frappuccino's and cold brew, which are less common in Italy. Former chief executive Howard Schultz has always claimed it was drinking coffee in Milan more than three decades ago that prompted him to found Starbucks. "Everything we have experienced, since that first moment of inspiration 35 years ago to now being a daily part of millions of people's lives around the world, we bring with great respect to Italy," he said at the store's launch. That respect may not be reciprocated. Italians can be somewhat "snobbish" about coffee according to psychologist Paolo Vergnani, who drinks 10 espressos per day. Surprisingly, though, coffee-drinking is a relatively young tradition in Italy. Before World War Two, it was a luxury import for the wealthy elite, and most Italians stuck to hot drinks made from toasted barley or chicory.